How many festivals is too many for Chicago? The Flaming Lips at Pitchfork Music Festival of 2009. 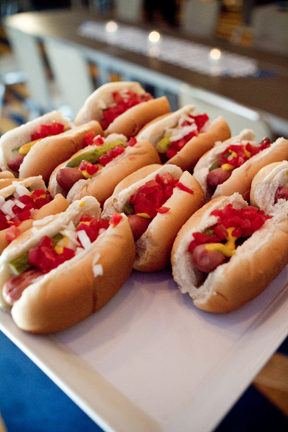 Of course Chicago has to have a sausage fest. The Chicago Blues Festival is a popular downtown fest. 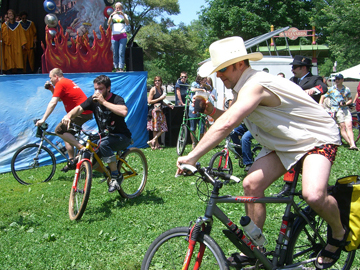 The Tour de Fat celebrates bike culture. How many Chicago festivals is too many? Gosh, it was hard to know where to start with this one, so I began with my own experience! I spend a good chunk of time rounding up events for WBEZ&apos;s weekly culture guide and the festival pitches come fast and furious and in a variety of forms: There are festivals organized around music, or ethnic groups, or even bloody marys. (Now, isn&apos;t that just like the North Shore to make a festival out of what most folks call brunch?) At first I wondered if Pacyna&apos;s question was driven by a slight case of festival overload. He wouldn&apos;t be the only one. This past weekend Curious City&apos;s Jennifer Brandel caught up with West Loop resident Vidya Sarma at the Square Roots Festival; that&apos;s the re-thought, re-named and re-located summer event hosted by the Old Town School of Folk Music in Lincoln Square. Sarma said her neighborhood is "probably five streets and I&apos;ve already seen a festival for each kind of street." In fact, if you were hankering for festival action, you had your pick; that same weekend there were at least eight other neighborhood festivals going on around town. Sarma believes she&apos;d get more bang for her buck if Chicago hosted one big festival a year, something she&apos;d "wait for and really savor and enjoy." But musician Lawrence Peters, who was at the Milwaukee Avenue Arts Festival, sees both sides of the coin. As a resident he agrees that the scene overall is close to achieving "critical mass" or, more bluntly, "insanity" levels. But they&apos;re also "great, as a musician, because there are lots of festivals to play." So our questioner Brandon Pacyna definitely has his finger on Chicago&apos;s pulse. But his interest is … well, a little more self-interested. Pacyna is an event planner (news flash: if you&apos;re not attending a festival you&apos;re probably hosting one!). In addition to booking music nights at Chicago bars, he&apos;s helping to run a fairly new music festival, out in Woodstock, Illinois. So his question is also an attempt to suss out the state of Chicago&apos;s overall festival economy: Whether or not this city&apos;s festival scene has hit saturation point has implications — positive or negative — for his own nascent, exurban festival empire. How many festivals does it take to keep Chicago hopping? The economics angle is interesting. Our musician man on the street Lawrence Peters points out that more festivals also means more competition, and you might opt for the one with the more popular musicians. So even among the pro-fest folks there&apos;s a tipping point. To better answer Pacyna’s question, we need a dose of something that looks like objectivity, and here it is, in the form of some street-level statistical analysis. Would you believe Jennifer Brandel ran into a music- or craft-beer-loving statistician at last week&apos;s festival? Lauren Gallager is the stats lady in question and, having calculated the number of Chicago weekends with "festival-worthy" weather (20), she decided Chicago could "support" 60 festivals a summer. Well, according to spreadsheets I got from the Department of Cultural Affairs and Special Events (DCASE) and the Chicago Park District, the city has thus far issued permits for over 400 events this year, with more to come (last year DCASE issued over 700 special event permits in all). Once Curious City’s Logan Jaffe subtracted out all the non-festival events (including what seems like a ton of 5k and 10k runs, though I suppose we need some way to work off all that festival food and beer), and we zoned in on the prime festival real estate (mid-May through September), we&apos;re looking at over 200 festivals a season. And that&apos;s not counting all the private or small events that don&apos;t require (or manage to evade) a city or Park District permit. Getting a "Special Event Permit" is no small feat — in fact there are a number of companies that, for a fee, will navigate the entire process for you. You need to submit a site plan, including information about any tents to be pitched or stages to be built. Your food vendors have to obtain special sanitation certificates, a process that requires taking a 3-hour course. You need to request street closures and tell the City how you&apos;ll recycle (a requirement which may strike some observers as ironic). You&apos;ll also need a liquor license and insurance. And, according to one festival organizer I spoke with, even after hosting these things multiple years in a row, they usually don&apos;t get their permit until the day before or day of their event. Bureaucracy can work in mysterious ways. Clearly many organizations small and large are managing their way through it all, and, according to DCASE Commissioner Michelle Boone, the City&apos;s ready and willing to have more. Her response to Pacyna&apos;s question was: "There can never be too many!" Boone says "you can come to the blues festival and not be intimidated or afraid about maybe going to some small blues club on the far South Side." Like other festival goers I spoke with, Boone sees our festival scene — from the big events like Taste of Chicago to the small neighborhood block parties — as trend-setting sources of pride. The future of Chicago&apos;s festival scene: Less is more? Of course quantity doesn&apos;t necessarily mean equality. I recently spoke with Michael Scott Jr. of the Chicago Park District. The District, with money from the Chicago Community Trust, just kicked off a three-part music festival (hip-hop, gospel, R+B) on Chicago&apos;s West Side. When I asked why he said, despite what looks like a glut, Chicago actually suffers from "festival deserts." 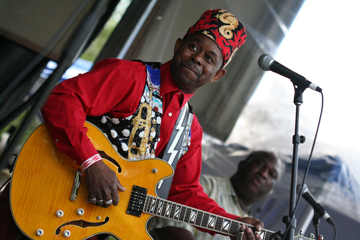 Scott said "There&apos;s the African Festival of the Arts, the Taste has something, Blues, Jazz, Gospel — they&apos;re all hosted on some other place than the West Side of Chicago." Though the Park District is in charge this year, Scott says he hopes community members will take over the festival down the road. If they do, they&apos;ll face increasing costs. Starting this year the City no longer foots the bill for electricity (organizers need to rent generators), nor does it cover the cost of street closures (waiving that used to be aldermanic privilege). Eric Williams, who has hosted the deliberately small but very popular Sound System Block Party for ten years running, says rising costs and a more complex application process is proving to be a breaking point for his event. Williams&apos; store, The Silver Room, is a Wicker Park institution, one that was on Milwaukee Avenue long before gentrification transformed the area. He pays for his event mainly out of his own pocket and thinks this is "something the city needs to figure out — how to work with individuals and institutions who are trying to bring things to the city that are different than … nothing against sports bars, but we got a lot of sports bars here." Williams can&apos;t afford to pay more but he doesn&apos;t like the alternative to city largesse: corporate sponsors. That usually translates into beer tents, which goes against the nature of his event. But here’s an endnote to answering Brandon Pacyna’s question about festivals: I&apos;m also seeing evidence that changes to the festival funding scenario are having an impact. Lately I&apos;ve been getting pitches not for festivals, but for festival fundraisers! Add those to the many small arts organizations already using Kickstarter campaigns to fund their public events. But glut or no, the City may well be planning to bring more big-ticket festivals to Chicago; there are proposals for 3 new festivals and one big dedicated festival site in the recently released Draft Cultural Plan. Chicago&apos;s festival "eco-system" is definitely a story to watch!